A darkness has fallen over the once-sleepy seaside town of Middleport, and townspeople are mysteriously disappearing at an alarming rate! Reports of monster sightings, ghastly galleons and possessed artifacts have made their way to London; newspapers claim the town is haunted by an ancient curse! You've been summoned from London as an Inspector from the Royal Society of Skeptics to dispel the rumors that dark magic is afoot in Middleport. 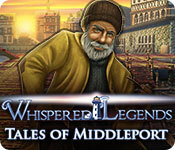 Uncover the true cause of the disturbances and track down the disappeared townspeople before darkness falls on Middleport forever!